The Tomcat check is included in the Datadog Agent package, so you don’t need to install anything else on your Tomcat servers. This check is JMX-based, so you need to enable JMX Remote on your Tomcat servers. Follow the instructions in the Tomcat documentation to do that. Edit the tomcat.d/conf.yaml file, in the conf.d/ folder at the root of your Agent’s configuration directory to start collecting your Tomcat metrics and logs. See the sample tomcat.d/conf.yaml for all available configuration options. See the JMX Check documentation for a list of configuration options usable by all JMX-based checks. The page also describes how the Agent tags JMX metrics. 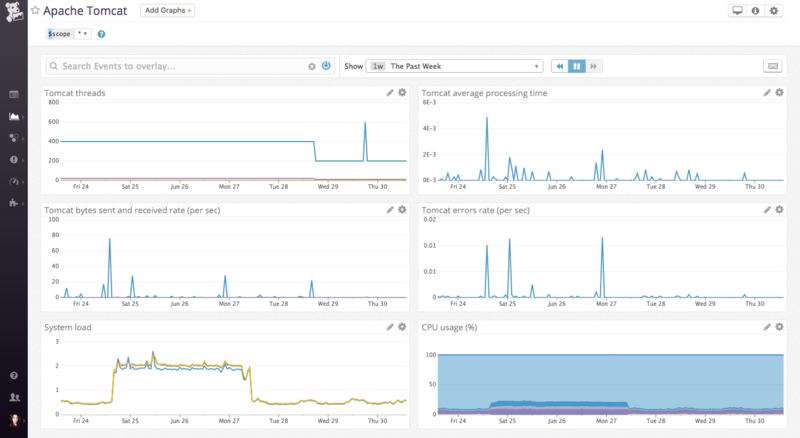 Restart the Agent to start sending Tomcat metrics to Datadog. tools_jar_path No Should be set when process_name_regex is set. trust_store_path and trust_store_password No Should be set if com.sun.management.jmxremote.ssl is set to true on the target JVM. key_store_path and key_store_password No Should be set if com.sun.management.jmxremote.ssl.need.client.auth is set to true on the target JVM. rmi_registry_ssl No Should be set to true if com.sun.management.jmxremote.registry.ssl is set to true on the target JVM. include Yes A dictionary of filters. Any attribute that matches these filters are collected unless it also matches the “exclude” filters. exclude No A dictionary of filters. Attributes that match these filters won’t be collected. Your metric is mydomain (or some variation depending on the attribute inside the bean) and has the tags attr0:val0, attr1:val1, domain:mydomain. See the sample tomcat.yaml for all available configuration options. For the case above, the metric aliases specified become the metric name in Datadog. Also, the metric type can be specified as a gauge or counter. If you choose counter, a rate per second is computed for this metric. Note: List of filters is only supported in Datadog Agent > 5.3.0. If you are using an older version, use singletons and multiple include statements instead. Check Tomcat logging documentation for more information about Tomcat logging capabilities. Change the path and service parameter values and configure them for your environment. See the sample tomcat.yaml for all available configuration options. Run the Agent’s status subcommand and look for tomcat under the Checks section. (gauge) The maximum number of allowed worker threads. (gauge) The number of threads managed by the thread pool. (gauge) The number of threads that are in use. (gauge) Bytes per second sent by all the request processors. (gauge) Bytes per second received by all request processors. (gauge) The number of errors per second on all request processors. (gauge) The number of requests per second across all request processors. (gauge) The longest request processing time (in milliseconds). (gauge) The sum of request processing times across all requests handled by the request processors (in milliseconds) per second. (gauge) The sum of request processing times across all requests to the servlet (in milliseconds) per second. (gauge) The number of erroneous requests received by the servlet per second. (gauge) The number of requests received by the servlet per second. (gauge) The number of accesses to the cache per second. (gauge) The number of JSPs per second that have been loaded in the web module. (gauge) The number of JSPs per second that have been reloaded in the web module. The Tomcat check does not include any events. tomcat.can_connect Returns CRITICAL if the Agent is unable to connect to and collect metrics from the monitored Tomcat instance. Returns OK otherwise.